While Thornton takes a share of the lead onto the third round safe in the knowledge that his maiden European Tour win this season has guaranteed his card until the next of next year, Higgins needs a big cheque to put his card worries aside. Ranked 163rd in the Race to Dubai standings, the quiet Waterville man is running out of time to keep the card he won back at last year’s Q-School. And after a three under 69 left him tied for fourth, just a shot behind co-leaders Thornton ((67), Felipe Aguilar (66) and home hero Francesco Molinari (67) on eight under, he has just one plan - keep hitting fairways. “It is great,” said the 40-year old, who is €125,000 short of salvation. “If you are in the last few groups on the weekend then it means you are doing something well. I am looking forward to it. “I can play this course - so as long as I can keep hitting it well off the tee I will be fine. It’s exciting to be up there – if you are not excited by that then there is something not right with you. On a day when Peter Lawrie’s season took another turn for the worse with his sixth missed cut from his last seven starts, Higgins grabbed the early clubhouse lead when he carded four birdies and just one bogey in another controlled round. “It was good,” he said. “I didn’t hit it as close as yesterday but hit some nice shots and made four birdies so I was pleased with that. “If you keep hitting the fairways n this course you can manage it and get a lot of opportunities and I am good at that. I just have to keep doing it. 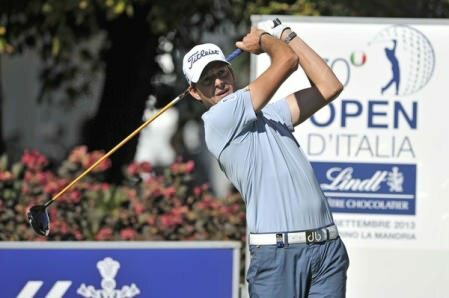 Confidence is hard to come by when you are struggling but Higgins is buoyed by his performance on a tight course at Golf Club Torino. “A lot of the courses we are playing are very long and force me to try and cut corners but that is not the case here,” he said. “Round here you have to hit it straight down the middle all day long and that is what I am good at. Bradford-born Thornton, who captured his maiden title when he won the dual ranking event at St Omer in June, is still just 135th in the Race to Dubai and keen to win again and secure his place in the DP World Tour Championship in Dubai. Five under for his round with two to play, he bogeyed the 17th but hit back with a closing birdie to grab a share of the lead with Molinari and Aguilar. Thornton said: “I played very similar to the way I did yesterday – lots of fairways and greens and managed to hole a few putts again so very happy with the result. The adopted Irishman does not plan to change his approach over the weekend and hopes that he will draw confidence from his St Omer win if he finds himself in the mix on Sunday afternoon. “I hope so! My game is still the same and the plan is still the same,” Thornton said. “The main thing that you take from winning out here is the fact you know you can get over the line because you have done it already. Joint overnight leader Nicolas Colsaerts could only manage a 71, slipping back to joint fourth with Higgins and Steve Webster (69). Damien McGrane had an eagle and three birdies in a 69 to move up 19 spots to 25th on four under but the rest of the Irish missed the one-under par cut. Gareth Maybin (74-71) missed by two and Michael Hoey (77-69) by three as Lawrie came up a single shot short. The Dubliner, 39, has made just one cut in seven starts following his share of 10th in the Irish Open at Carton House at the end of June. Level for the tournament with eight holes to play, a double bogey six at the 11th knocked him back and while he birdied the 12th and 14th, he could not pick up another shot on the way home. A 106th in the Race to Dubai, Lawrie needs a decent result soon to banish any fears about finishing the season inside the top 110 who retain full playing rights for 2014. 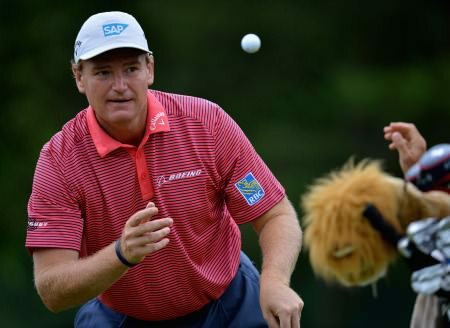 Ernie Els is tied for the lead in Munich. Picture © Getty ImagesSuper straight David Higgins knows that will a little more luck on the greens he could be even further up the leaderboard in the BMW International Open in Munich. Simon Thornton watches his opening tee shot in the final round of the Portugal Masters. Picture: Eoin Clarke/www.golffile.ieTwo bogeys in his last three holes might have cost Simon Thornton €53,800 but the Newcastle professional’s was still pleased to add another notch to his belt in terms of experience as he finished tied for eighth behind a fast-finishing David Lynn in the Portugal Masters at Oceânico Victoria Golf Course in Vilamoura.